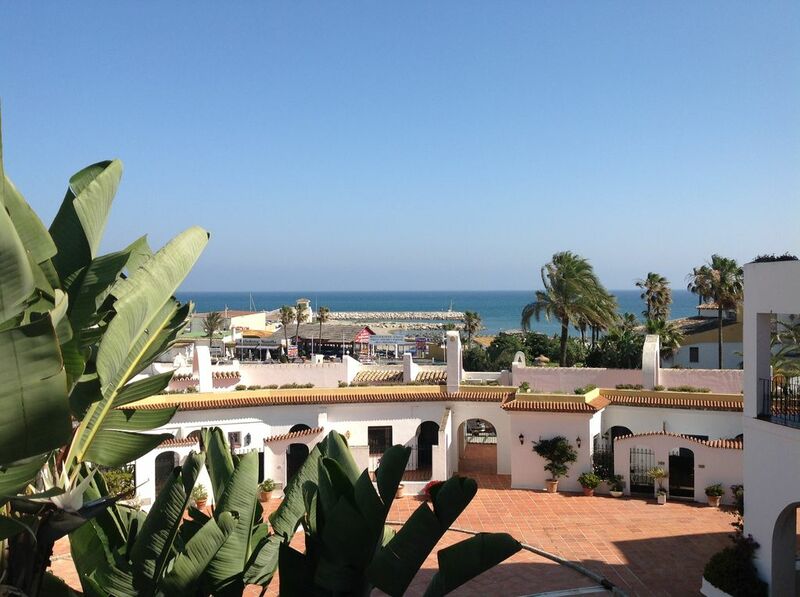 This character modernised apartment enjoys a prime position in the wonderfully picturesque Puerto Cabopino. The property is over three levels with a rear terrace and front patio from which there are panoramic views. On the middle floor is the lounge and diner with re-fitted kitchen and on separate floors are the two bedrooms and the re-fitted bathroom with shower. Off the lounge is the balcony from which there are stunning views over the marina with the beach and sea in the distance.. The 2 bedrooms are positioned at the back of the apartment, - a principle double bedroom with fitted wardrobes and king size bed plus a smaller second bedroom with two single beds. There is a re-fitted bathroom with shower. Air conditioning (hot or cold) is installed. There is a barrier pass available to the residents car park. The apartment has superb south facing views from the balcony to the Marina with the beach and sea beyond. There is an additional large rear terrace which provides a sheltered and shaded area to relax. Puerto Cabopino is a delightful child friendly development uniquely designed to create the feel of an Andalucian village. There are two swimming pools many bars and restaurants. Calahonda offers a larger selection of shops and Marbella centre (12km) and Fuengirola (14km) are both easily accessible by car, taxi or bus. The beach at Cabopino is accessible direct from the private gardens and pool area. You can also get to the pool from the apartment without crossing any roads. It is renowned and regarded as the best beach in the Marbella area. There are a number of beach restaurants plus beds and watersport hire facilities. We live in England, but spend most of our holidays in Spain and over the years increasingly Puerto Cabopino. We thought about buying years ago when the children were younger and now I wish we had. Anyway having stayed in many apartments at the port over the years it at least meant we knew where to buy when the opportunity finally arose. We bought our first apartment in 2006 and this one in 2015. Modernisation and re-modelling was required and this was finished in December 2015. I don't encourage over occupation hence why we say upto 4 people maximum. We enjoy having numerous bars and restaurants virtually on our doorstep. This means we can arrive without a car and still not feel isolated. The regular bus services into Fuengirola and Marbella are also invaluable and reliable. Re-fitted bathroom with bath and shower. Residents parking area accessible to renters via barrier pass. Re-fitted kitchen with oven, hob, microwave, refrigerator and washing machine available. Numerous golf courses including Las Mimosa de Cabopino at Cabopino, plus Miraflores, Las Cala etc etc. Notes on accommodation: There is hot/cold air-conditioning. Internet access is available. Cleaning / Towels / Linen / Maid service: The apartment is cleaned before and after a guest stay. There is an adequate supply of towels. A minimum of two padded beach beds are allocated by the pool although no beach towels are provided. Other: Balcony with outstanding marina and sea views. Rear terrace. A delightful apartment in the heart of Cabopino port with a great selection of bars and restaurant's all within walking distance of five minutes. The view from the apartment balcony is truly breath-taking with views of the ocean and the port itself. The apartment was comfortable with all that we required for our extended stay. I would suggest a hire car should you wish to explore the many sights around the costa del sol, but failing that for those of you who like a good walk? the beach board walk stretches as far as Mijas in one direction and to Marbella in the other direction. Andrew the apartment owner was very helpful and was available when needed. All in all I can safely say that I will be returning at some future date. Well designed apartment, lovely view. We enjoyed our stay at Cabopino, the area is very pretty and I am sure in the summer full of activity. We were curious just how much had closed down for the winter months but it did not spoil our break. The conservation area was beautiful and the board walks made enjoying the area a pleasure. A very nice area to visit. Again we had a lovely time at Andrew’s panoramic apartment in Cabopino.We are becoming regulars now and not surprising..excellent gardens ,pool and access to beach and sea.So relaxing..no car,bus fine to Marbella.Local restaurants very good and excellent choices.The apartment so light,clean and comfortable,ideal for relaxation.We we’re celebrating 50 years marriage and chose here as first choice...simple..1st class..Return a must. Myself and Debs really enjoyed our week long stay in this superb apartment. Andrew the owner was very helpful and answered any questions quickly and efficiently and everything was found to be exactly as described. The apartment itself is very central, clean, bright, airy and well equipped with wonderful views from the kitchen, living room and terrace out over the harbour and sea. The grassed and private pool area is fabulous with plentiful and comfortable sun beds together with umbrella shades, the pool area also has direct access out onto the main beach. The large sandy beach is great for couples and families alike and has numerous bars and restaurants for lunch and snacks. The new boardwalk also means that you can do plenty of walking in all directions to burn off the lunch. The harbour itself is perfect being small, compact and lively without being loud giving it a really friendly feel and atmosphere. The harbour restaurants are excellent with all tastes catered for and are also very reasonably priced so you do not really need a car to drive anywhere else. We particularly liked Alberts, La Despenser on the harbour and La Playa which is located on the beach to Calahonda side of the harbour. We would have no hesitation in recommending this apartment and would love to be able to return again next year. Excellent apartment with beautiful views of the marina. Apartment was clean and modern with everything we needed. Thanks to Andrew for making the booking easy and straightforward. The beach at Cabopino is accessible direct from the private gardens and pool area. Malaga approximately 30 minutes by car. Local mini market in the port. 7 day opening garage also has a small supermarket area selling fresh bread. More facilities at Calahonda, La Cala, Fuengirola and Marbella - all accessible by bus. Booking Notes: Minimum one week during peak times. Minimum 4 days other times. £250 returnable breakage deposit. Smokers are requested to use the balcony or terrace. We reserve the right to decline applications.